German Chancellor Angela Merkel has said Germany will stand with Ireland "every step of the way" over Brexit.She was speaking following talks in Dublin with the taoiseach (Irish prime minister) about the current deadlock.Parliament is still no closer to passing a Brexit deal, with the UK scheduled to leave the EU on 12 April.Ms Merkel was asked if it was possible to protect the integrity of the single market without an Irish border being in place.She said: "We will simply have to be able to do this. We hope for a solution we can agree together with Britain. "Where there's a will there's a way. We still hope for an orderly Brexit. "Ms Merkel said they hoped intensive ongoing discussions in London would lead to a situation by next Wednesday "where Prime Minister Theresa May will have something to table to us on the basis of which we can continue to talk".She added: "Until the very last hour - I can say this from the German side - we will do everything in order to prevent a no-deal Brexit; Britain crashing out of the European Union. "But we have to do this together with Britain and with their position that they will present to us. "Leo Varadkar restated his commitment to an open border in Ireland with free movement of people and frictionless trade, with no tariffs and no checks.He added: "We don't want Ireland to become a back door to the single market in the event of a hard Brexit. "He said the two leaders had discussed planning for a no-deal Brexit. Their meeting comes just days after Mr Varadkar held discussions with French President Emmanuel Macron in Paris.On Wednesday, the EU said 12 April was "the ultimate deadline" for approving the Withdrawal Agreement.It has been rejected by MPs three times, with DUP MPs voting against it - while independent unionist MP for North Down, Lady Hermon, voted in favour. 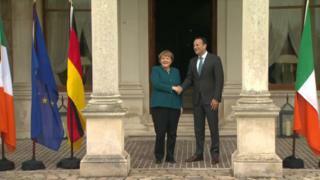 Speaking ahead of Ms Merkel's visit to Dublin, the taoiseach said she was "a strong and unwavering ally of Ireland".Ahead of their meeting, the taoiseach and chancellor also held talks with people from Northern Ireland and the border area about the impact a no-deal Brexit could have on their livelihoods.Mr Varadkar said it was "important" to hear the voices of people who lived and worked along the Irish border. It is five years since the German chancellor was last in Dublin and although the Angela Merkel era is in its twilight she remains the most powerful politician in the EU.Both she and Leo Varadkar are among the EU leaders who most want to avoid the UK crashing out without a deal.She has been, as the taoiseach said an "unwavering ally", and most supportive of the Northern Ireland peace process.Mr Varadkar has admitted there are difficulties in protecting both the single market and the Good Friday peace agreement while preventing a hard Irish border.